Nolan’s adaptation of the Batman trilogy has become one of the most popular series in the movie business, beginning in 2005 with “Batman Begins.” At the time, the film was considered one of the greatest Batman films ever made. However in 2008, its sequel, “The Dark Knight,” surpassed all expectations and even managed to be better than the first. The success of these films led to “The Dark Knight Rises,” receiving an incredible amount of hype. Some people questioned whether or not the film would be as great as its predecessors. After seeing the movie, I can definitely say that this film has lived up to the good name of the series. One of the reasons the Dark Knight movies received great praise from fans and reviewers alike was due to each film’s engaging plot. In “The Dark Knight Rises,” the story is a twister of tortuous turns and plot devises. The movie takes place eight years after the Joker’s attempts to throw Gotham City into chaos in “The Dark Knight.” Bruce Wayne lives in seclusion after having his alter ego, Batman, receive the blame for the actions and death of Harvey Dent, a.k.a. Two-Face. However, the Dark Knight is called again from the shadows when mercenary and terrorist, Bane, threatens to destroy the city of Gotham. Although the movie does use the same “League of Shadows attacks Gotham City” formula from “Batman Begins,” the device works by introducing interesting background info on the group of assassins. One of the most captivating aspects of the film was the acting. Christian Bane still does a great job as multi-millionaire Bruce Wayne and the caped-crusader Batman. Tom Hardy gives a stunning performance as Bane, the primary antagonist of the film. However, at times I had trouble understanding what Bane was saying due to his muffled voice. The most surprising performances, however, came from Anne Hathaway as cat-burglar, Selina Kyle, and Joseph Gordon-Levitt as the young, tough-as-nails cop, John Blake. Hathaway, as the sharp-witted Selina Kyle, Catwoman, stole every scene she appeared in. Gordon-Levitt fantastically played the role of Blake, a young, idealistic cop who tries everything in his power to save Gotham from destruction. Michael Caine also does a great job as Wayne’s butler Alfred Pennyworth, bringing hard-hitting emotion to the film. It’s a joy to see both Caine and Bale’s characters interact with each other, as Pennyworth tries to act as a father figure to an otherwise compulsive Wayne during the film’s exposition. Also, as Wayne Enterprises Secretary Miranda Tate, Marion Cotillard deftly acts as a foil to some of the other characters. Other characters, such as Commissioner Gordon (Gary Oldman) and Lucius Fox (Morgan Freeman), take a backseat in this film. Even though they play their parts well, they are overshadowed by the more interesting characters played by Hathaway and Gordon-Levitt. The film relies heavily on its environments and action scenes, which are incredibly done. 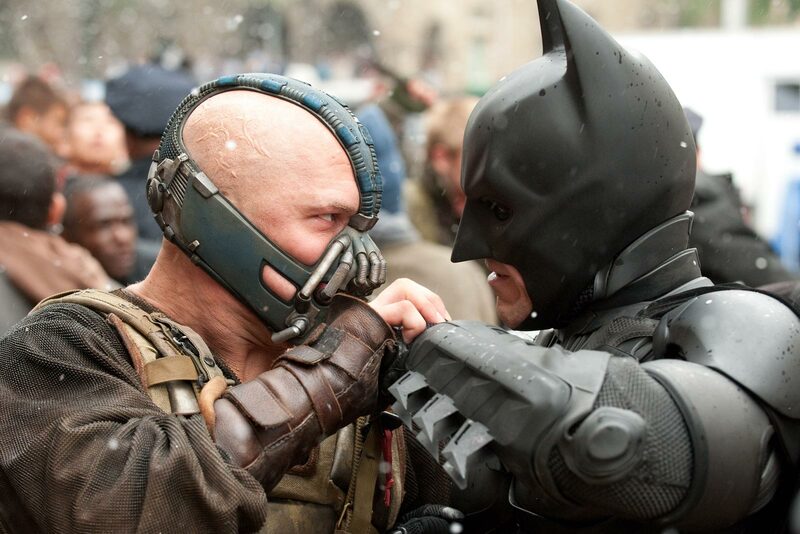 “The Dark Knight Rises” is one of the best-looking films of the summer due to being shot with IMAX cameras. The dark setting portrayed in the movie brilliantly reflects upon the tone, giving the viewer a feeling of omniscience throughout the film. The film’s action sequences are particularly well done, especially in the fights between the main characters, Batman and Bane. Conversely, Selina Kyle’s slick fighting style acts as good contrast to Batman and Bane’s more brutish methods of fighting. Through its dynamic plot, impressive cast, tightly-packed fighting scenes, and crystal-clear picture, the finale in Christopher Nolan’s Dark Knight Trilogy is one that cannot be missed. Look for “The Dark Knight Rises” on Blu-ray, DVD, and Digital Download on December 3, 2012.